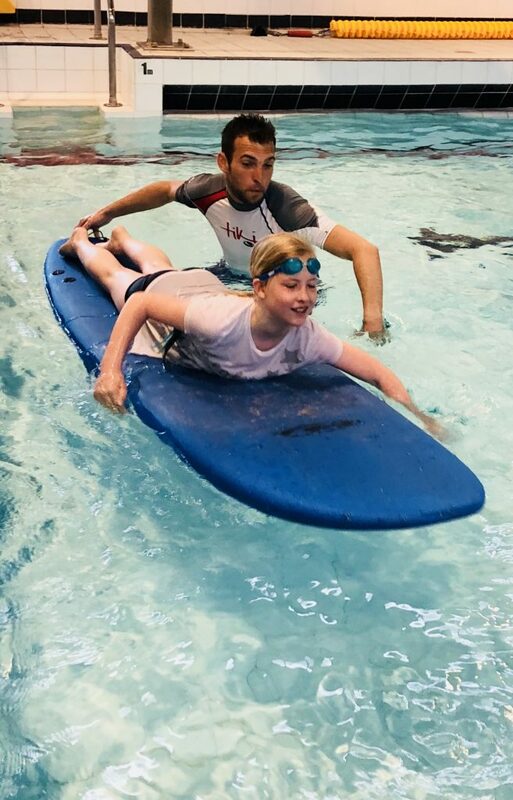 A recent partnership involving Active Schools Moray (Forres ASG) and the SwimABLE and SurfABLE projects run by accessibility charity Friendly Access, is proving to be inspiring success. The first block of sessions which took place at Forres Swimming Pool who have wholeheartedly supported this project, involved 8 primary aged children with medical conditions such as Dyspraxia, Autism, Cerebral Palsy, ADHD, muscle weakness, lack of coordination and balance, Neuro development disorder and Dyslexia, which made it difficult for them to be involved in mainstream sports sessions. All were diagnosed or awaiting diagnosis. These inclusive structured swimming lessons are for all abilities and all ages. The sessions are person centred and children develop their confidence in the water, and key skills for swimming. A variety of equipment is used within the sessions including floatation aids, flippers, fins, masks, toys and hoops. The sessions on surf boards in the pool introduce a completely new experience for children they are a great form of exercise working on balance and coordination and give an extra sense of fun that can really keep participants engaged. The hope is that familiarity with the equipment and skills learnt in the pool will get kids ready for trying surfing out in the sea. Glyn Morris, Chief Executive, Friendly Access, “Taking part in an adventure sport activity is generally thought ‘out of reach’ of many, therefore it is very easy to understand the positive impact for individuals with disabilities and conditions. At Friendly Access, we mostly consider the environment as being the disabling factor and not the individual. Therefore, we look towards how we as society can adapt to support accessibility. We’re humbled yet inspired to see our recent innovative projects such as SwimABLE and SurfABLE Scotland being so well received by the very people our projects are aimed at. SurfABLE Scotland is the first fully adaptive and inclusive surfing school in Scotland and based in Lossiemouth, it is the world’s most northerly surfing therapy programme. Kev Anderson, Sports Development Manager, Friendly Access, “It’s incredible to be a part of such an amazing partnership project. I sometimes forget how challenging life with conditions and disabilities such as the ones our participants live with can be, and the importance of sessions like these to give those who may need a little extra help the opportunity to take part, achieve and have fun. By clicking the subscribe button you consent to be notified of News and Events as they are published. Thank You. New events and news will be emailed to the address you provided.